Chomolhari trekking in Bhutan where trekkers go to the base camp of Mt. Chomolhari and often come back with a sense of the majesty of high altitudes where life ticks to a different time ..
Mt. Cholmolhari the most sacred mountain in Bhutan, which houses the female Goddess and towers at a height of 23,997'. Trekking in Bhutan is a unique experience unlike many of the more crowded treks offered in Asian Himalaya. The variety of treks range from a simple 3 day Druk Path trek from the district of Thimpu to Paro to the 25 day legendry snow man's trek that takes veteran trekkers through some of the most exquisite sports in the country. Almost all the treks in Bhutan offer a combination of Natural discovery and an insight into the country's delicate and unique daily life. One of them is the Chomolhari trek where trekkers go to the base camp of Mt. Johomolhari. 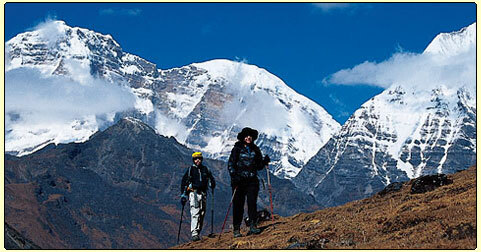 Bhutan's most deeply venerated peak on the boarder of Bhutan and the Tibetan region of China. Trekkers often come back with a sense of the majesty of high altitudes where life ticks to a different time. The Bhutan Jhomolhari trek can be also combined with Darjeeling and Sikkim tour, or Rajesthan region tour of India like Taj Mahal, Jaipur, Delhi. Can also be combined with Nepal trek or Tibet ( Lhasa) tour. Please write us for the details. Fly to Paro Bhutan Overnight at Hotel. 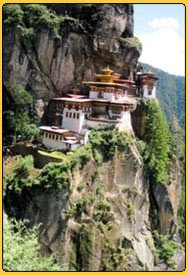 Sightseeing of Paro and Excursion to Taktsang monastery Bhutan, overnight at Hotel. Day 11-14: Trek to Dodena and drive to Thimphu Overnight at Hotel. Day 15 : Sightseeing of Thimphu, later drive to Paro Overnight at Hotel. Fact File: Chomolari trek Bhutan - walking and trekking holidays in Bhutan - the last Shangri-la on earth ! Availability: Every week from March to Nov. (weather permitted), however Dec, July- Aug is not recommended. Price for trek: Please ask for the price.